Blues of the North for Red of the South. We left the warm southwest for home and 2" of snow on the 3rd day of April. Folks say and I agree that this is the longest winter we've ever known, in contrast to the Southwest that had a dry year. I wonder how it will go for the folks in L.A. who depend on this watershed for water. 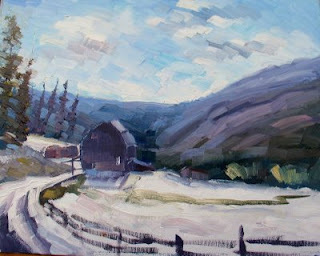 I went a little farther north to my friend and fellow artist and horselogger, Rod Gould's. I thought we had it bad until I got across the line and found even more snow although the sun came out for us as we stood in the mud and painted Canadian skies. My pallet went from a warm, high key Burnt Sienna to a cool Ultramarine/umber pallet that took more energy if only because it was Colder! From Sante Fe to Taos a backroad winds through the mountains. There are lots of paintings I missed but we managed to find time to stop at this extraordinary adobe church built because of the vision of a farmer and is a sacred healing place that many come to pray and take some of the dirt of the place away with them. I saw folks on crutches and wheel chairs, young and old. 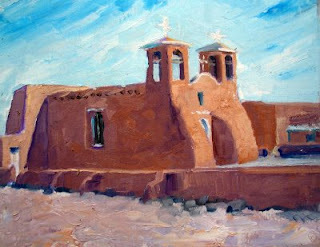 We stayed in Taos which was NOT Sante Fe. 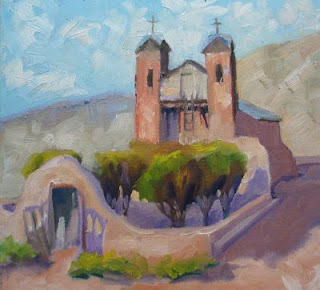 I found the Church of St. Francis Assisi in Rancho De Taos, made famous by so many artists, including Georgia O'Keefe. Real Adobe is so human. It is workman toiling, it is native material, it is a grand vision with deep roots. Betts prayed, I painted. Both our efforts payed off. Stayed at the Cameron Trading Post near the notorious Lee's Ferry, NM. Wonderful stonework gardens. We got on the Trading Post road through the High Colorado Plateau, marveling at the red rock dinosaur eggs, stopping at a couple pueblos for a gander at pottery, jewelry and horse blankets. We stopped at the Hopi First Mesa and got the opportunity to talk with Hopi artist, Lawrence Namoki and wife Lucida, traded for one of his pots, decorated with Hopi Katchina, the One Horn God, Two Horned God, Sun God and Warrior. Lawrence explained as much as he could about his work in the 4 hours we had. Lawrence pushes the envelope of Hopi tradition with his art but stays true to the craft and world view of his people. 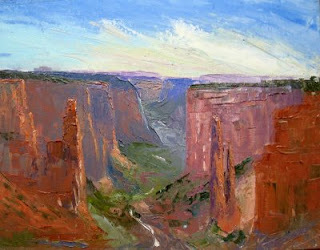 We got the deep fried Chinle, in time to view the sun setting on the red rock Canyon de Chelly, a place I could spend the rest of my life painting. I couldn't help but feel it is one of the sacred places of the planet. What a wonderful place to be now and in the past, a sacred place to the People of the southwest. As I was painting Spider Woman Rock, the sun was coming up, smoke from a hogan rose from the roof. A person came out and threw their blanket over a horse and rounded up sheep and goats. It felt surreal to witness such a moment, as if time stood still. Legend says that the white color on the top of Spider Woman Rock is the bones of bad little children. Pretty convincing. 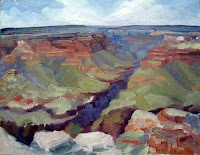 When we hit the Grand Canyon I jumped out with my easle and disapeared into the landscape. It was a perfect day, a little overcast but warm at this high altitude untill the sun went down then the wind from the Canyon whelled up and the temperature went down with the sun. 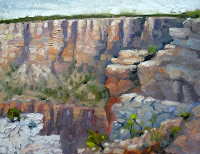 The Big GC is a little daunting expecially for a pleinair painter trying to get something said before the light changes. I think I managed to pull off what I did because I'm using my pallet knife to load color onto the canvas in order to cover ground fast, try to make the color, value and temperature selection on the pallet, block it in and move on, coming back to finesse whatever needs attention. With so much beauty and granduer to filter, I knew I had to get in to the moment and let whatever come through that could. I did 3 sketches by the time the sun went down. Unfortunately Betts got worried as I had left the trail and didn't rendezvous when and where I said I would so she got the Rangers stirred up to come looking for a loss arteest. I got back in time to thank the gentleman and enjoy the wonderful chicken and martinis on the tail gate of our rental car. Twas a Grand time at the Grand Canyon.